Raimy informs Frank that her mother will be murdered unless he can prevent the crime from occurring. Meanwhile, Raimy follows a lead in the Nightingale case, as Frank and Satch pursue the same lead back in 1996. A little too much manufactured drama in this episode - Raimy's fighting with Frank over telling Jules about her impending death made little sense; unless they were going to coordinate some way for Raimy to give some future event proof like the the World Series play-by-play she's just asking him to look like a lunatic. Just a quick note, the casting director did an amazing job with the woman who plays Raimy's mom. She and Peyton List look so much like each other! Agreed, I have trouble with faces and I thought they were the same person a couple of times. I'm starting to worry about logistics now... like why haven't they set up a "10 pm is ham radio time" schedule or something? I didn't mind it, actually, since the character is dealing with something crazy. Basically she's dealing with her mom's death, even though everyone in 2016 thinks she's been dead for years, and having her "denial" and "bargaining" stages of grief by literally trying to undo her death. But she's powerless to do anything about it herself. She's also kind of approaching this in a childish way, i.e. "If we just tell her what day she's going to die it will fix everything!" but her father is thinking about how believable that's going to sound coming from him, and how little good it will do when they don't know exactly how it's going to happen. I am really looking forward to her memories when she's got a dozen-plus timelines bouncing around in her head. Will she start writing things down in a little journal? I liked how she fought with her father. She's panicked and powerless, and for a minute there regressed to when she was a kid. It makes emotional sense that she would act that way this time. 1) Is she going to tell him about 9/11? I know that she's developing a policy of "don't mess with time unless you have to", but this is SUCH an obvious one, and well within Frank's abilities. How about other historical events from 1997 to 2016? 2) Also, I have to remind myself that she didn't grow up with time travel SF like I did. She has to teach herself how to deal with timeshifts. 3) Is it just me, or is the vaguely creepy 'best friend next door' a Chekov's Creep? I mean, it's either that, or he'll turn out to be a massive nerd who can explain timestreams to her. 1) Is she going to tell him about 9/11? I know that she's developing a policy of "don't mess with time unless you have to", but this is SUCH an obvious one, and well within Frank's abilities. Movie-Gordo was mostly comic relief, and something of a barometer of the current level of fucked-up-ed-ness of the main character as he went from 'guy who lost his firefighter dad in a tragic but normal fire' to 'guy whose mother got horribly murdered by a crazy serial killer'. If they meant to do the same thing with show-Gordo, I don't think it's really there in the writing yet, and the actor doesn't seem to be enough of a scenery-chewer to make jokes out of nothing. TV Gordo is giving me the creeps so far. Man, I just wanted Ramey to SPEAK THE HELL UP to her mom. Gah. I guess I'm the only one who liked Gordo... He seems to genuinely care about Raimi but I don't see him being any kind of time travel expert. Just a guy who's willing to bring over a 6-pack even though he has no idea why you're upset. RE: Not talking to her Mom -- she said she was worried about butterfly effect stuff -- how will it affect things? -- but I kind of wonder if she just didn't want to believe in this version of her mom. "Mom isn't supposed to be someone from 20 years ago that you talk to with a magic radio, she's supposed to be HERE!" I wanted to add that I AM enjoying the show immensely, and am putting some of Ramy's hasty decision-making down to all the shocks she's getting in rapid succession. It's weird to me that they chose a 50's-style HAM radio instead of some 1996 technology, like a more modern radio or a CB or a cellphone. I'm hoping they'll have a scene where Dad is in the garage and the radio lights up, and he says "Raimi? Are you there?" and a male voice comes on instead and says "No, it's your dad in 1966. Are you messin' with my ham radio again?" 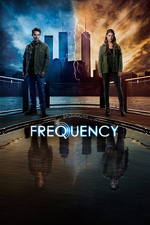 Hey, Frequency is on Canadian Netflix! I could also watch it on cable tv, but I am using Netflix for the better closed captioning. It's adding episodes at the same rate as the live broadcast.